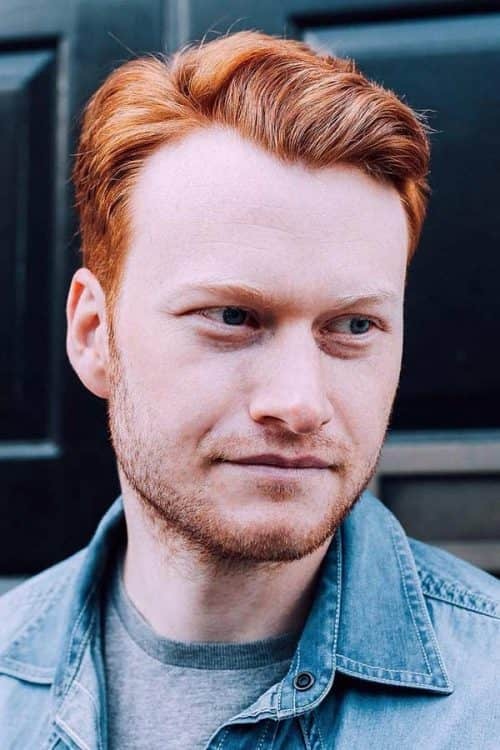 If you desire to rock a clean cut that draws attention to you from the moment you walk into a room, the Ivy League haircut may be exactly what you’re looking for. We will explore various ways how this haircut can be worn as well as the pros and cons of having this trendy haircut. 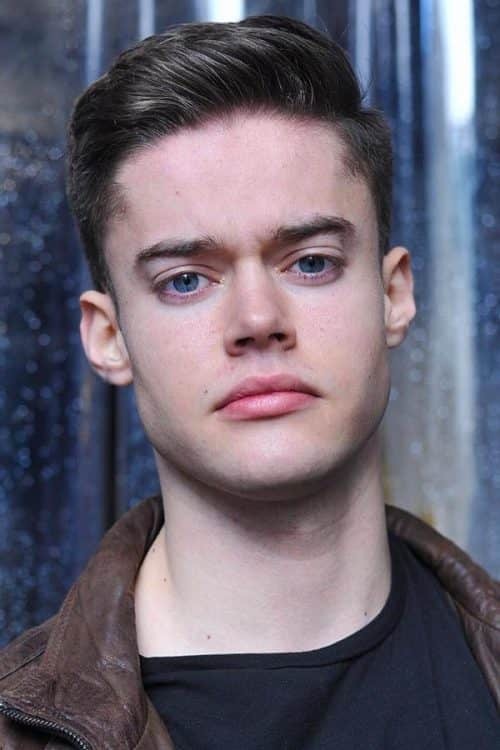 How To Get The Ivy League Haircut? 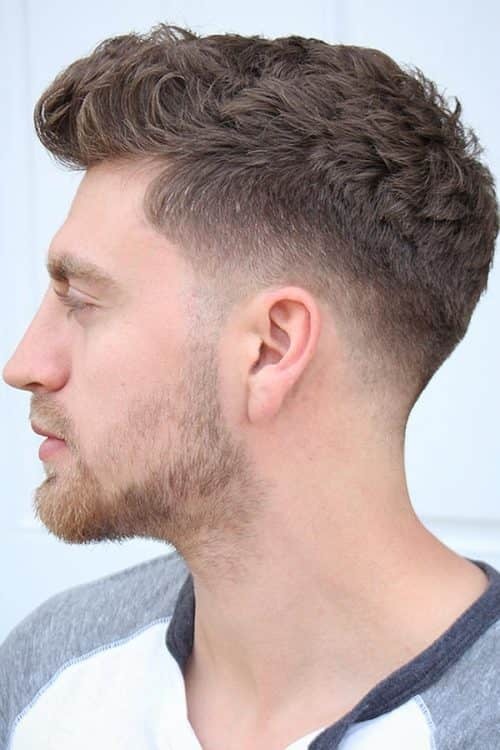 How To Style The Ivy League Haircut? The Ivy League haircut is the ideal cut for someone with strong facial features. It is cut the same way as a crew cut. However, it leaves enough hair on top to be parted and styled to one’s taste. The short length of this cut will keep any cowlicks at bay. And low-maintenance is the bonus feature of this haircut. Are you ready to explore trendy and cool ways of styling your Ivy League cut? In order to obtain a men’s Ivy League haircut, there really isn’t a lot of things necessary. Your hair should be at least an inch and a half in length since the standard length for the top is 1 inch. The length in the front is typically an inch and a quarter, which is the reason for the needed additional length to obtain the cut. Also, there isn’t a lot of hair products required to get this look as it is fairly low-maintenance. Casual styling wax should be enough to get your hair to lay in a more than pleasing manner. When determining how to ask for an Ivy League haircut, the most important factor is assuring that you find a barber or stylist who is familiar with the cut you desire. Once you have secured the barber, the next choice you should make is what degree of taper you wish to achieve. This choice is entirely a personal preference, and you are in the driver’s seat with this decision. Keep in mind that the finished variant of this style should have a seamless appearance without sharp edges or lines. 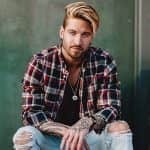 When it comes to the matter of how to style hair men typically want something that is both attractive and easy. 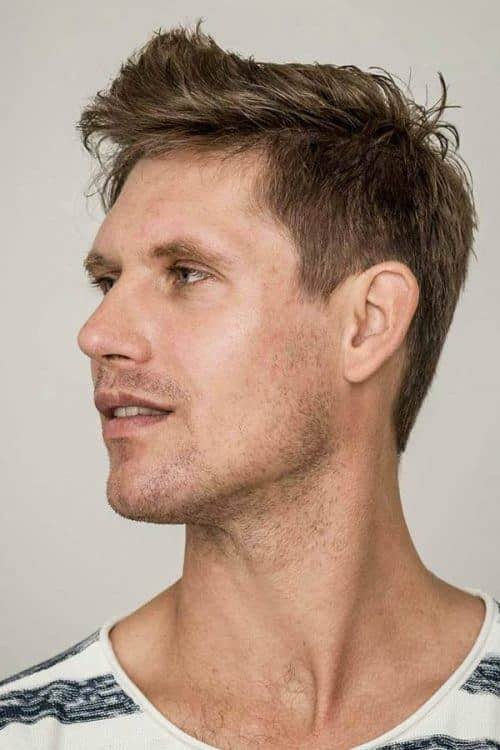 This is one reason the Ivy League haircut is so popular – there is not as much of a worry of how to style short hair men with a cut that is this low-maintenance. 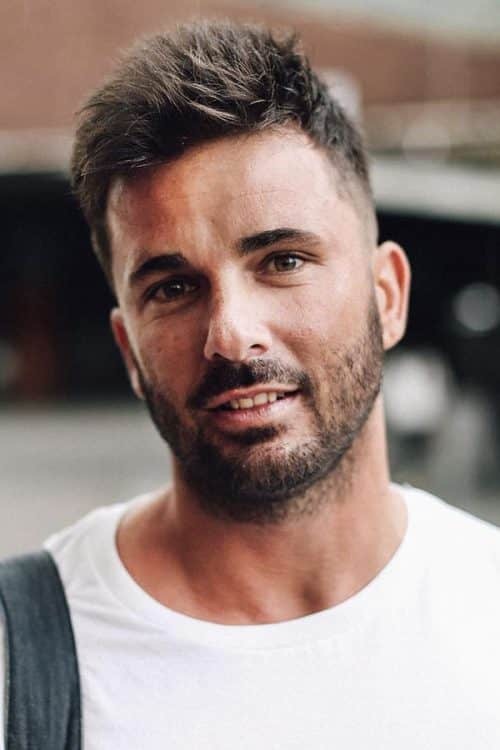 When it comes to the specifics of how to style men’s hair with this type of cut, it is seriously simple. 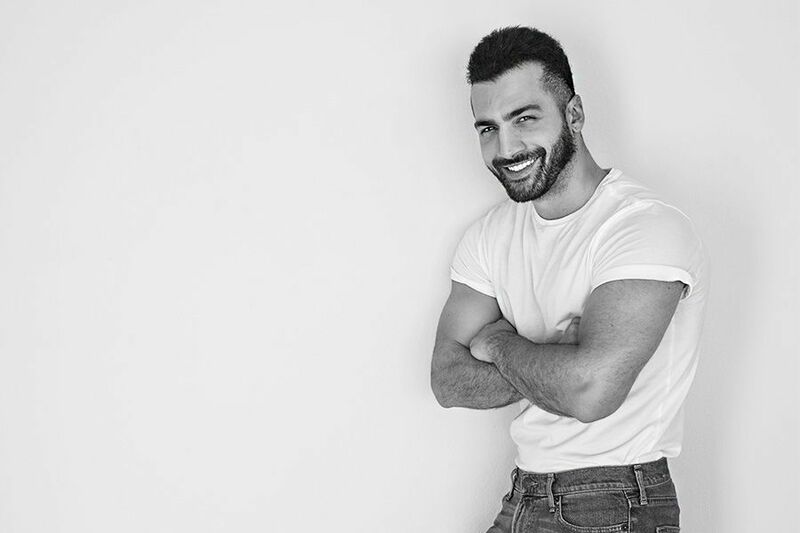 All that is required to achieve the right look is some hair product and a decision as to whether you choose to part it on the side and comb it back or go for a more relaxed look and style it with your fingers. When it comes to the modern Ivy League haircut, today’s versions tend to be a bit more on the longer side. The side and back are still tapered and blended into the length, but they are nowhere near and closely cut as they have been in the past. 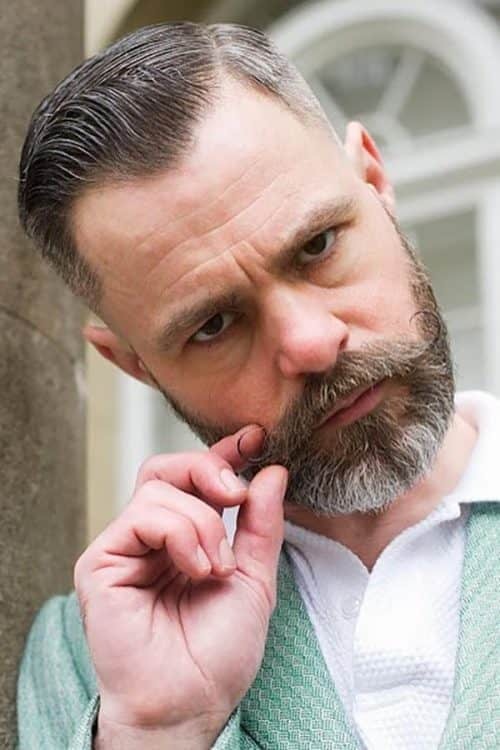 The Ivy League cut can be coupled with a fade haircut as well, and this look has become very popular among men with facial hair. 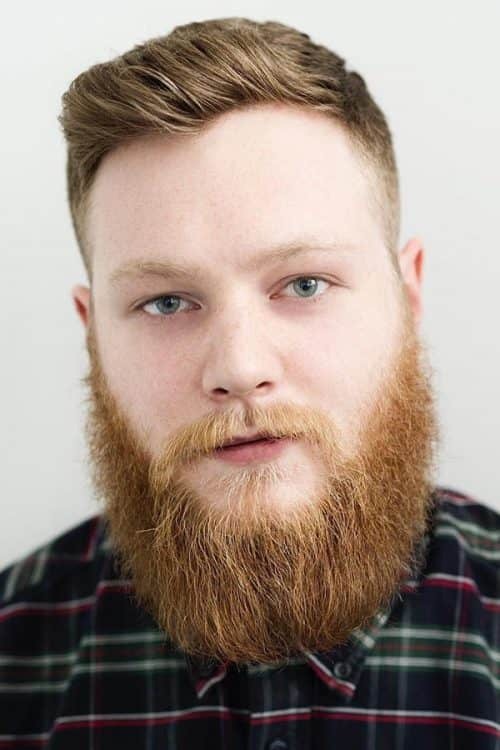 The high fade like in this photo looks fantastic with a bearded face. And the sharpness of the styled top adds to the class of the overall hairstyle. The Ivy League cut has an obvious connection to the taper. The taper haircut gives the impression of sophistication and style all rolled into one haircut. The taper cut can be worn and styled to one’s particular preference. The side part is not a solid necessity for it. 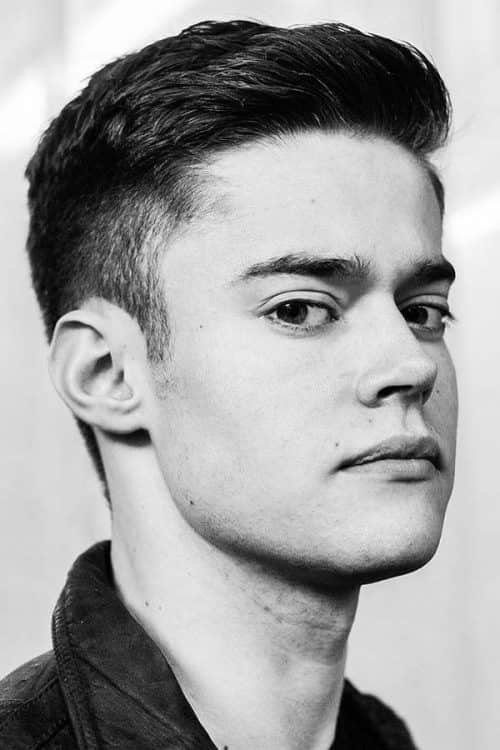 Another option for the Ivy League cut is the spiky hair option that quickly becomes more and more popular. Whether you opt for short spiky hair or a longer version, the choice is entirely up to you. The spiky hair option is a bit more on the edgy side. Short spiky hairstyles are all the rage for younger men who want to have a neat but not too sophisticated appearance. The Ivy league is a cut that works well as one of the haircuts for men with curly hair. The taper and blending allow the hair to have a gradual transition that works well for this type of hair. There is not a large array of haircuts for curly hair men to choose from. But this is by far one of the best options as opposed to going extremely short. This style is easily maintained with a little hair product and your fingers, and you can be out the door and on your way. The Ivy League haircut also looks great on textured hair. The sides and back of the hair are cut in a fade, and the top is tapered in to blend properly. This is a low-maintenance hairstyle that calls for a small number of hair products and your choice of style. It can be worn with a part but most often it is styled with the fingers and you’re set for your day. This style is also worn in a messy or unruly fashion to achieve a more rugged look. For those who aspire to achieve the look of a gentleman, the quiff hairstyle should be a serious consideration. The modern quiff has charming flair and looks especially good on men who sport facial hair. The clean, sleek quiff hair is a highly desirable style among men from all walks of life. But is most popular among middle-aged and older men due to its mature, refined look. The Ivy League hairstyle is very compatible with side part hairstyles. One of the most popular features of side part hairstyles men love is its classic and debonair look. While women’s hairstyles have a side part, the men’s side part is typically much more off center to either side. This cut could be considered high and tight but when you throw in the side part men have now dubbed it the Ivy League. There is a new style trending the past few years, and the popularity of the hard part haircut is growing rapidly. 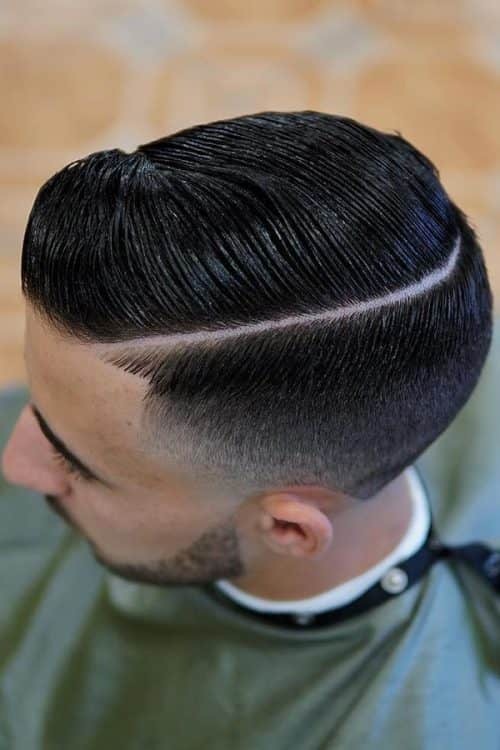 The difference-maker with this cut is the part not simply being a division line in the hairstyle, but it is actually a shaved line in the style that can’t be moved or altered. Therefore, the definition is in the title – the hard part. Hard part hair can be varied and cut into several different styles. But it is important to recognize that a hard part can’t be immediately altered without a drastic cut. To attain the gentleman’s cut that Matt Damon effortlessly pulls off, apply a pomade to your hair so that it would look wet. The top section can be styled in any of the Ivy League male haircuts, while the sides are given a low fade. 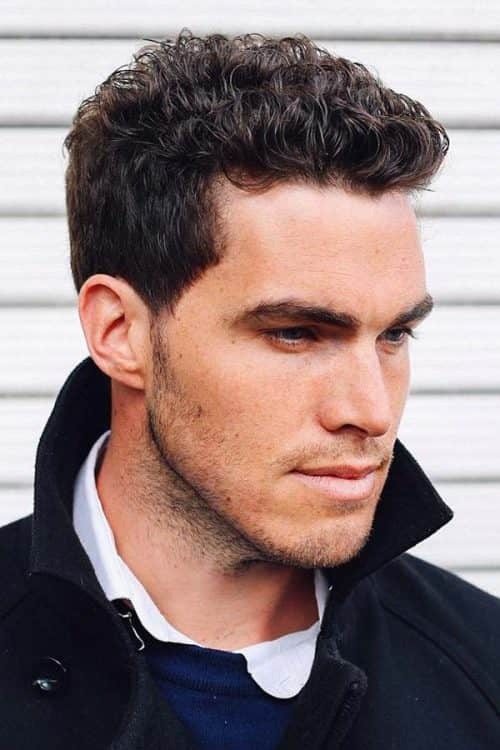 This true gentleman haircut creates a mild contrast with the sides being shorter than the hair going up in the crown direction. 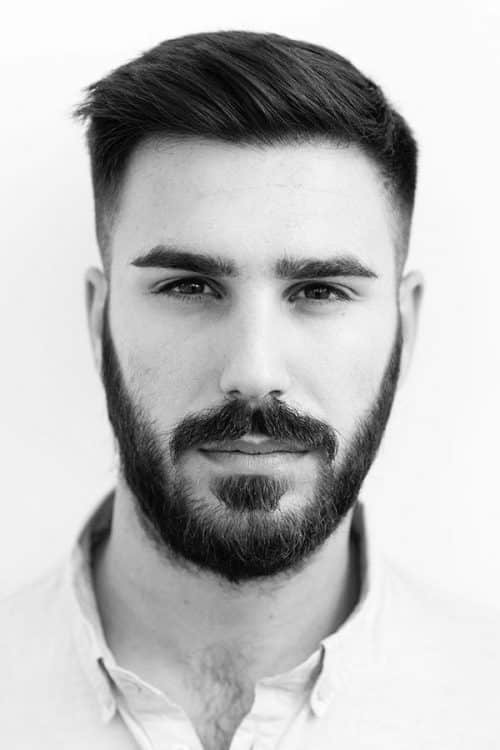 Rayan Reynolds opts for a very popular mens haircut. His top hair sports a crew cut with a visible side parting. For an added touch of the wet look, use a pomade of your choice. Once the hair is dry, it starts looking breezy and tranquil. However, don’t forget that this style requires a constant upkeep, so pay your barber visits regularly. Zayn Malik hair looks unbelievably attractive from dusk till dawn. Even though it appears so elaborate, this is a low-maintenance men hair style. The Classic Bachelors Ivy League hairstyle includes faded sides and longer side parted top. It’s one of those short haircuts men find really flattering yet time-saving. 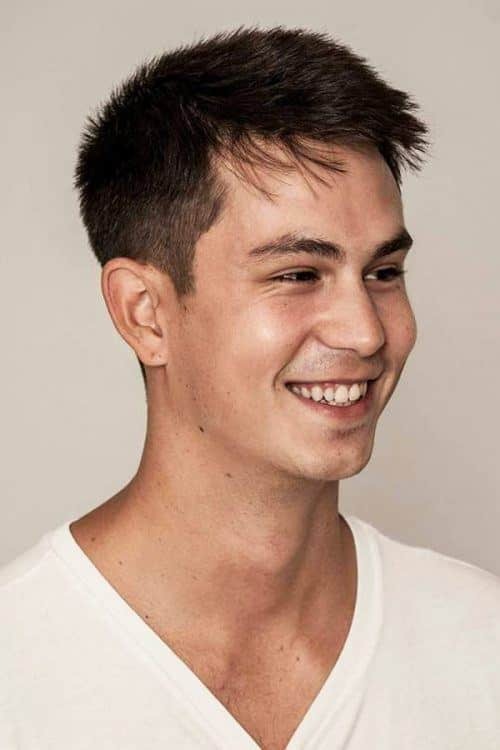 If you’re considering a bit longer hair cut for men, go for a brushed back top with a side parting. To give the hair a defined shape and wet look, add a small amount of a hair pomade. 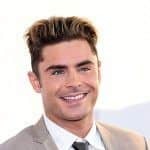 The men with oblong face shape will find this hairstyle extremely flattering because it helps to balance the narrowness of their face features. The buzz cut belongs to the same category of the short hair men haircuts as the crew cut does. 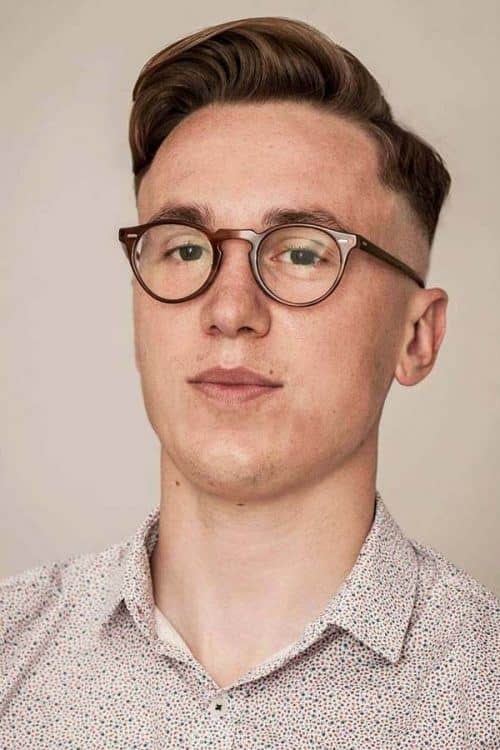 The main difference between them is that the buzz cut implies trimming the hair on top with scissors, while the crew cut employs clippers. To accentuate your masculine facial features in a formal environment, go with one of Channing Tatum’s men hair styles. To recreate the look, you need to brush back the top hair to one side, while the front is styled with a quiff. The sides are cut short, which adds to the boldness of the look. What’s good about the side swept undercut is that with the minimum input, you get the maximum outcome. In addition, it works well for both thick and thin hair. As for the length, this exquisite example of good haircuts for men works perfectly on the medium length locks. 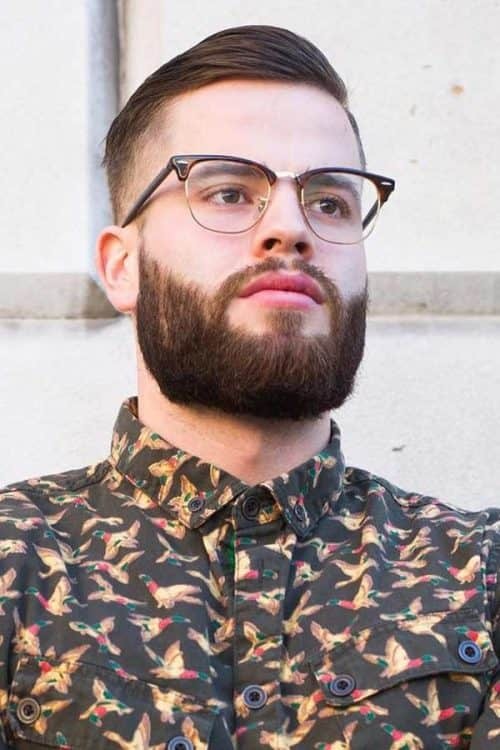 Pairing short hair with beard has become a really good tradition, especially if it concerns Ivy League hairstyles. 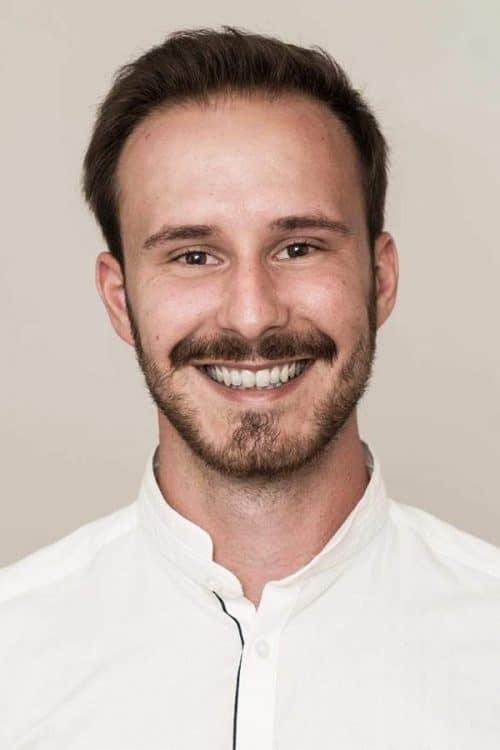 The facial hair doesn’t let this formal and stylish haircut look too preppy. 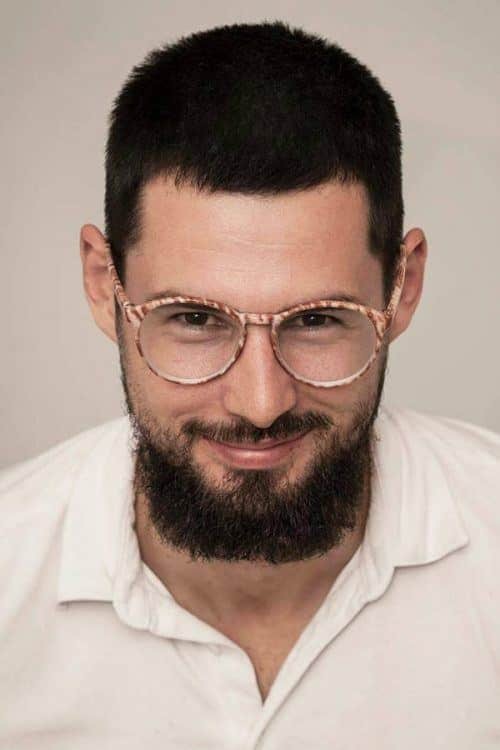 Instead, the well-trimmed beard brings the haircut into casual territory. To nail a comb over haircut, ensure that the hair on top is slightly longer than the sides. Apply a styling product to the front section of the top hair to give it some texture. Comb over the hair on top with the fingers for a stylish and defined look. What a nice lift there is at the front though! Short messy hair looks won’t probably lose their relevance ever. Even among the Ivy League (haircuts), there’s room for messy hair men styles. The sides should be cut short, while the top requires some length so that it could be disheveled. Accentuate the texture of the cut with a hairstyling product, like a hair pomade or wax. There is a variety of styles to choose from in each hairstyle category. The Ivy League hairstyle is no different, and its air of refinement can sometimes cross over into a more edgy style ever so slightly. The Ivy League hairstyle is a classic and rather conservative look that a lot of business professionals acquire due to the refined flair it exudes. This cut is not exclusive to the group, however, and looks fantastic on almost all hair types and facial shapes.